The other day, I was asked to draft a scope of work for a new client after a few weeks discussing his business, his processes, his target audience and friction points along the customer journey. Every savvy sales rep or manager knows how important momentum is to matriculate prospects through the sales cycle. I’ve waited anxiously for price and scope responses more times than I care to count. And no one wants to stalk a prospect during crucial points in the business development cycle…over-eagerness is the surest way to relinquish credibility, leverage and flow. 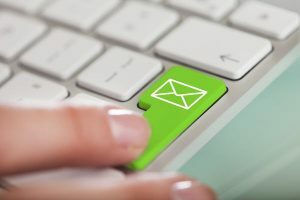 Wouldn’t it be great to know exactly when your email was opened so you can time your follow-up accordingly? Wouldn’t your follow-up conversation be stronger if you were able to say, “I see you’ve received the price quote you requested. I’m calling to follow up to see if you have any questions I can answer for you”? Definitely. Given how sensitive my communications typically are with business leaders, maintaining confidence is essential. I was able to do just that. Unlike Act!, Zoho, Salesforce and WiredContact allow for emails to be tracked in real time. When the message is sent through the CRM, it puts a 1×1 transparent pixel in the email. If that image is “requested,” then the CRM immediately reports the email as opened. No clunky third-party apps or plug-ins. These CRM systems are fully integrated so critical data is shared with the people who need it, when they need it. We also integrate them with company processes to ensure great and seamless customer experiences throughout the cycle. And no awkward follow-ups. This tool can be used for all emails so communication statuses are always informed, be they price quotes or support sessions or dinner invitations. Like anything else, better information = better choices. Smoother communications = fewer hiccups in your sales cycles and business processes throughout your company. WiredContact can track whether an e-mail is opened without sending a read receipt. 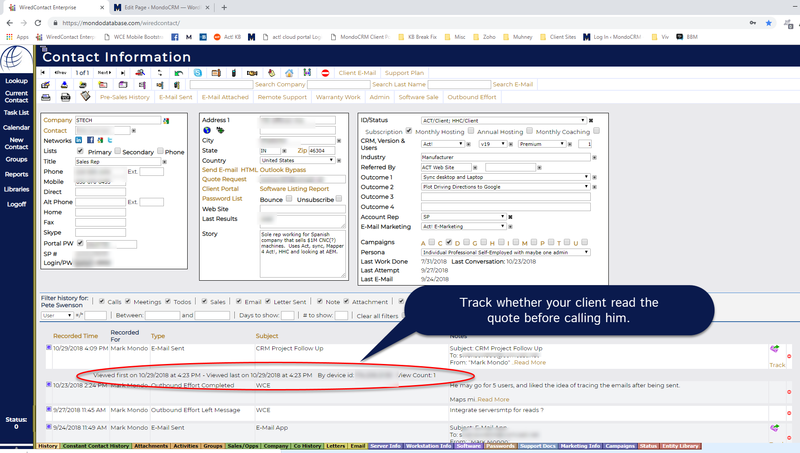 Zoho CRM tracks e-mail when generated from within Zoho CRM also. I met Mark Carter in 2006 at a local networking event in Chicago, and I consider him one of the best at on-site networking to generate new business. In this interview, Mark and Brynne discuss how to use social media and avoid leading networking events just talking about you and your sale. So how does this relate to CRM ? Out of the box, CRM usually requires a degree of customization; otherwise, it remains under utilized. CRM software is feature-rich, and I help people put on the final touch to really help my clients close more deals. I was at a client site configuring a CRM system when I heard this conversation. Caller (Blocked caller ID): Is Dan there ? JoEllyn: No. He's out of town. Can I help ? Caller: No. Honey. Just get him on the phone. Caller: I'm not gonna reduced to a piece of paper. Tell him Gene's on the phone. Get up out of your chair and get him ! Caller: How unprofessional of you! I'm gonna call Dan and tell him you conduct business. Is this the era of Mad Men where men treated women like chattel to get their way ? Belittling someone and attempting to scare them to pass you to a business owner just does not work. Let's see. "Gene" knew nothing about this place. He only has the INTERNET, Hoovers, Linkedin, ZoomInfo and PR Newswire or Broadlook as tools to learn about Dan before attempting a foolish and outdated method of making connections. With the wealth of free information and social media, these useless conversations can be reduced. I'd like to see your comments and thoughts.